Double M is a Progeny Test herd for Genex. I’ve talked about what a Progeny Test is here, but basically we AI cattle each year using new young sires in the Genex line up along with a reference sire. Last spring, the ranch’s replacement heifers were bred to Thunder and McCoy. We also bred a smaller group to Solution and a bull we call 1289 but the majority of the heifers were bred to the Thunder/McCoy mating. Today I thought I’d show you a few of the McCoy calves since he’s so new. McCoy is a new young sire that Genex calls a “Bet the Ranch” bull – and I’d easily agree. We have had zero trouble with the McCoy calves. The heifers easily had their calves, the head & shoulder shape on the cattle is conducive to calving ease and the calves are phenotypically correct. 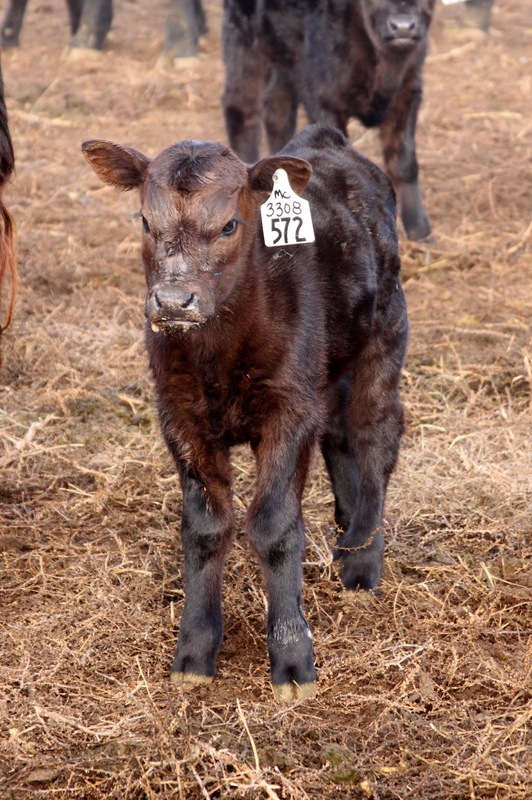 You can check out McCoy’s EPD’s for all of the info – but I think sometimes it’s nice to hear what really happens first hand after the calf is born. 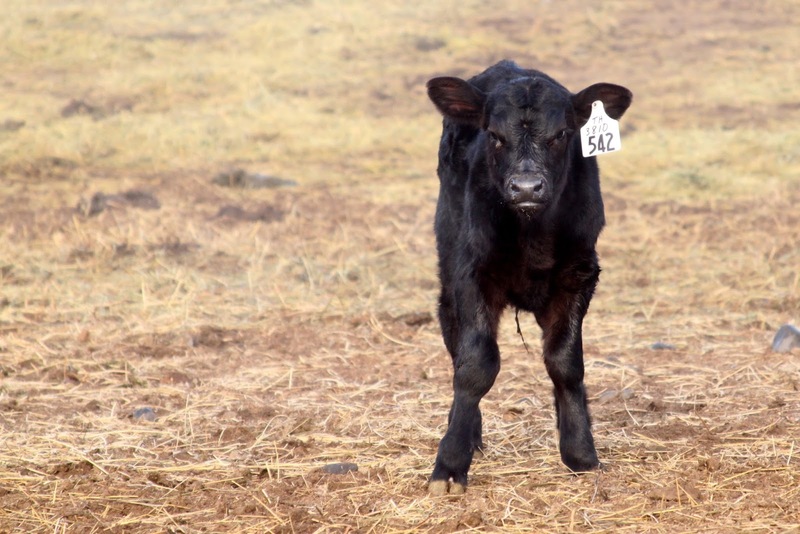 We AI’ed about 185 heifers last year – and as of Sunday, we’ve tagged 112 calves. The heifers due date was 1/22 for the first time breed so I’m calculating conception from this weekend – I know there were a few repeat breeds, but for the purpose of this post I’m not considering those. So that means we had about a 60% conception rate, which we think is right on target. Of the 112 heifers that calved, we had 3 sets of twins. The lightest calf we’ve had was 44 pounds (it was 10 days early) and the heaviest was 90 pounds. The average calf weight has been 70 pounds. The McCoy calves have also coincidentally averaged 70 pounds as well. The calves pictured in this post were born starting Jan. 7 up until this Jan. 21. They are numbered in sequential order - so a calf with an eartag of 501 was born before 502, etc. The heifers are commercial, but are primarily Angus and Simmental. Double M tries to keep the cattle at a 5/8 Angus, 3/8 Simmental cross as a general guideline. The heifers are developed on flood irrigated pastures in the spring, summer and early fall and have been on long hay since October. Now for the stuff that you don’t want to admit to – but if I were a rancher looking to use a new bull, I’d want to know. We’ve lost three calves during calving – we had two sets of twins where we had one alive & one dead. We lost another calf early on to a cow we ended up performing a c-section on but we missed her during the breeding process and should have culled her for her pelvic size then. Out of the 112 calves we’ve pulled 7 of those – 2 had legs back, 2 were the sets of twins I mentioned above, and 3 heifers were just being dumb and wouldn’t lay down and have their calf. I bet some of you can relate to that. I guess I mention the above because we haven’t had to pull anything due to size or shape – which is important to consider when considering a heifer bull. A Thunder calf (left) and a McCoy calf (right) for comparison - both were born on the same day. A Solution calf (left) and a McCoy calf (right) for comparison - again, both born within a day of each other. Overall – we are thrilled with how the heifers handled being bred to both Thunder & McCoy. If you haven’t used either of these bulls – I’d easily recommend using them in your replacement heifers. (Heck – the calves are good enough, you could use them in your cows as well.) If you’re a herd that’s used Thunder in the past and are looking for something new – try McCoy. I think you’ll find he lives up to his name – he is The Real McCoy. If you have questions about the cattle – feel free to leave a comment below, or contact us using the Contact tab above. We love talking cattle and are happy to share both the positives and negatives…..although this year, we haven’t really found too much negative. Which is a blessing when you’re calving heifers.